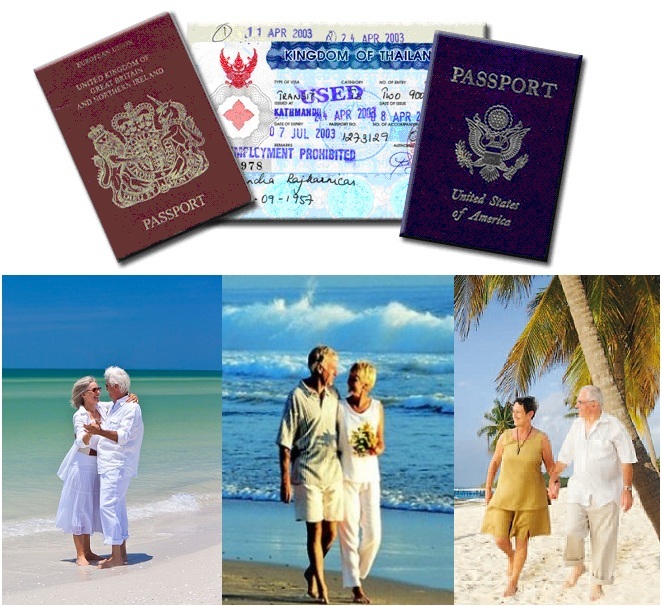 Thailand has been a popular choice among many foreigners of retirement age as their second home or retirement country. Thailand has all the amenities for a retirement haven to many foreigners who flock to the country to visit and after their wonderful vacation in the Kingdom will decide to make Thailand a permanent second home. The country’s warm climate and a variety of fantastic landscape and beautiful retirement locations spread across the country are some of the reasons foreign retirees decide to retire in Thailand. Retirement locations can range from cool, mountainous terrain, pristine beaches or the cosmopolitan city lifestyle. Communication facilities, transportation system, medical and health facilities are of international standards so foreigners don’t have to worry about staying in Thailand for a long time. If you want to apply for a retirement visa in Thailand, here’s how. In order to stay in Thailand for a long time, foreigners either apply for a retirement visa or the non-immigrant visa (O-A) which is the visa for retirees who will not work or engage in business in Thailand but would like to stay for an extended period. Validity of this visa is one year but it can be renewed each year for an indefinite period of time. To maintain this O-A visa, the retiree is required to report to an immigration officer before the end of a 90-day stay as a way to notify of the retiree’s current address and contact numbers. This notification may also be done by mail, by submitting some documents and forms to the Office of the Immigration Bureau. This procedure is done every 90 days. You could also consult an immigration lawyer for assistance. Failure to observe the requirements of Immigration Law pertinent to retirement or O-A non-immigrant visa may result to some penalties or cancellation of the visa being held. The notification to the Immigration Officer every 90 days must be made within 7 days before or after the 90 day stay period expires. A fine of Baht 2,000.00 will be imposed for failing to report on time. If retiree moves to another address during the 90 day period, the retiree should notify the Immigration Bureau of the change in address within 24 hours after the move is made. Failure to do so will result to facing a fine of Baht 5,000.00. If notifying by post or mail, the relevant documents must be sent by registered mail 7 days before the renewal date. Renewal documents cannot be processed if it’s past the 90 day limit. The retiree should go to nearest immigration office to pay the fine of Baht 2,000.00. Leaving Thailand without a re-entry permit to be presented upon re-entering Thailand will result to visa cancellation and must leave Thailand within 30 days. Overstaying or not departing Thailand prior to expiration of visa O-A. Overstaying visa holders will be fined Baht 500.00 per day up to a maximum of Baht 20,000.00. Overstaying for more than 20 days may result to possible jail time, deportation and being blacklisted in Thailand. Retirement visa application and renewal could be an easier task if you are properly guided by an immigration lawyer who has been in practice for years. If you are looking for an immigration lawyer in Phuket, you can see here who can help you.